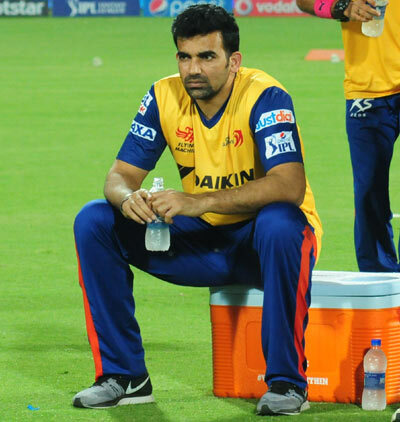 Still non-committal about Zaheer Khan's first appearance for Delhi Daredevils, Yuvraj Singh hinted at the left-arm pacer's inclusion in the playing eleven during the team's last home encounter against Kings XI Punjab in the Indian Premier League in New Delhi, on Friday. Zaheer, who was bought by the GMR-owned unit for Rs. four crore, hasn't played a single game for Delhi due to a hamstring injury. However, Yuvraj is positive about his former India team mate's return to the middle after a long wait of 12 months. The left-arm pacer played his last game for Mumbai Indians in the IPL in May 3 last year. "I don't know about the team selection, but I think he is playing tomorrow. You have to ask the coach (Gary Kirsten) and captain (Jean-Paul Duminy) about this but I think he is starting tomorrow," Yuvraj said on Thursday. Delhi have had an inconsistent run in the T20 league so far, winning just three out of seven matches, and Yuvraj believes his team mates need to fight till the very last delivery of the match. "I think we won two games in a row, we lost one and then won a game and then lost another one. It's not that we are losing games in a row. We are winning and losing. T20 is a very unpredictable format, anything can happen on a day. But the point is that we need to win few more games consistently to qualify for the last four. "I am sure we have the guys to do that and we just need two-three special performances in the next four games. We have had good wins and lost a few bad games, so we just need to fight till the end and try and win some games," said the left-hand batsman. Coming on the back of a decent domestic season for Punjab, Yuvraj, who has been the season's costliest buy for 16 crores, hasn't had the best of times with the bat, 124 runs in seven matches. However, the left-hander is not worried. "It's not easy because at times in domestic level at times you don't play the quality of international bowlers, so at times it's hard to come in and adjust quickly. I am not trying to give any excuses but T20 is a different form of domestic season, you hardly get time to get set and play your game. But that's the nature of T20 cricket," he said. Delhi have the advantage of getting the better of Punjab in their first game in Pune but Yuvraj is not complacent when taking on the bottom-placed team in the table. "Kings XI haven't had a very good season, we know that but at the end of the day they came and beat Rajasthan Royals, playing very good cricket. So as I said T20 cricket is very undpredictable. Five overs can take the game away from you and we just need to concentrate on the things that we are doing well and if we can bat, bowl and field well then I am sure we can win tomorrow," he said. "I think when guys have been playing in a team for a longer time and have been winning then they are confident. CSK has played consistent cricket and they have the confidence that they can pull it off in a tough situation and I think they have shown it, so they say it" said the 33-year-old player.